Requests for certificates of correction will be forwarded to the Certificates of Correction Branch of the Office of Data Management, where they will be listed in a permanent record book. If the patent is involved in an interference or a trial before the Patent Trial and Appeal Board, a certificate of correction under 37 CFR 1.323 or 37 CFR 1.324 will not be issued unless a corresponding motion under 37 CFR 41.121(a)(2), 41.121(a)(3), 42.20 or 42.22 has been granted by the administrative patent judge. See MPEP §§ 1481 and 1481.02. If the patent is involved in a contested case under 37 CFR part 42, subpart D, a certificate of correction under 37 CFR 1.324 will not be issued unless a corresponding motion under 37 CFR 42.22 has been granted by the administrative patent judge. Otherwise, determination as to whether an error has been made, the responsibility for the error, if any, and whether the error is of such a nature as to justify the issuance of a certificate of correction will be made by the Certificates of Correction Branch. If a report is necessary in making such determination, the case will be forwarded to the appropriate group with a request that the report be furnished. If no certificate of correction is to issue, the patentee making the request is so notified and the request, report, if any, and copy of the communication to the person making the request are entered into the file history by the Certificates of Correction Branch. If a certificate of correction is to issue, it will be prepared and forwarded to the person making the request by the Office of Data Management. In that case, the request, the report, if any, and a copy of the letter transmitting the certificate of correction to the person making the request will be entered into the file history. Applicants, or their attorneys or agents, are urged to submit the text of the correction on a special Certificate of Correction form, PTO/SB/44 (also referred to as Form PTO-1050), which can serve as the camera copy for use in direct offset printing of the certificate of correction. Where only a part of a request can be approved, or where the Office discovers and includes additional corrections, the appropriate alterations are made on the form PTO/SB/44 by the Office. The patentee is notified of the changes on the Notification of Approval-in-part form PTOL-404. The certificate is issued approximately 6 weeks thereafter. Form PTO/SB/44 should be used exclusively regardless of the length or complexity of the subject matter. Intricate chemical formulas or page of specification or drawings may be reproduced and mounted on a blank copy of PTO/SB/44. Failure to use the form has frequently delayed issuance because the text must be retyped by the Office onto a PTO/SB/44. The exact page and line number where the errors occur in the application file should be identified on the request. However, on form PTO/SB/44, only the column and line number in the printed patent should be used. The patent grant should be retained by the patentee. The Office does not attach the certificate of correction to patentee’s copy of the patent. The patent grant will be returned to the patentee if submitted. (A) Identification of the exact point of error by reference to column and line number of the printed patent for changes in the specification or to claim number and line where a claim is involved. (B) Conservation of space on the form by typing single space, beginning two lines down from the printed message. (C) Starting the correction to each separate column as a sentence, and using semicolons to separate corrections within the same column, where possible. (D) Leaving a two-inch space blank at bottom of the last sheet for the signature of the attesting officer. (E) Using quotation marks to enclose the exact subject matter to be deleted or corrected; using double hyphens (-- --) to enclose subject matter to be added, except for formulas. (F) Where a formula is involved, setting out only that portion thereof which is to be corrected or, if necessary, pasting a photocopy onto form PTO/SB/44. Column 2, line 68 and column 3, lines 3, 8 and 13, for the claim reference numeral '2', each occurrence, should read -1-.
should be changed to --fluorine--. 12. A control circuit of the character set forth in claim 4 and for an automobile having a convertible top, and including; means for moving the top between a raised and lowered retracted position; and control means responsive to a sensor relay for energizing the top moving means for moving said top from a retracted position to a raised position. Effective August 2001, the U.S. Patent and Trademark Office (USPTO) publishes on the USPTO website at www.uspto.gov/patents/process/search/ authority/certofcorrect.jsp a listing by patent number of the patents for which certificates of correction are being issued. Under the automated publication process for certificates of correction, each issue of certificates of correction will be electronically published on the USPTO website at www.uspto.gov/patents/ process/search/authority/certofcorrect.jsp, and will also subsequently be listed in the Official Gazette (and in the Official Gazette Notices posted at www.uspto.gov/learning-and-resources/official- gazette ) approximately three weeks thereafter. The listing of certificates of correction in the Official Gazette will include the certificate’s date of issuance. 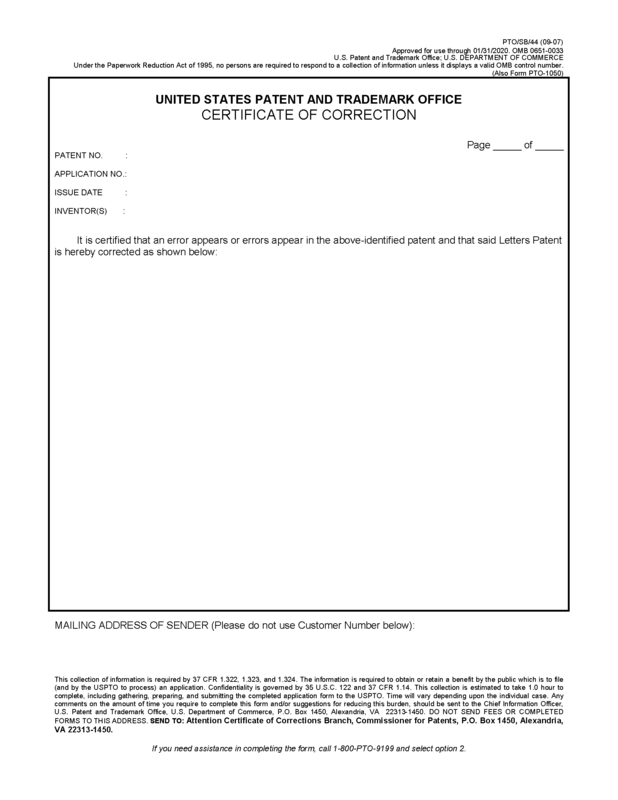 On the date on which the listing of certificates of correction is electronically published on the USPTO website: (A) the certificate of correction will be entered into the file history and will be available to the public; (B) a printed copy of the certificate of correction will be mailed to the patentee or the patent’s assignee; and (C) an image of the printed certificate of correction will be added to the image of the patent on the patent database at patft.uspto.gov/. The date on which the USPTO makes the certificate of correction available to the public (e.g., by adding the certificate of correction to the file history after signature) will be regarded as the date of issuance of the certificate of correction, not the date of the certificate of correction appearing in the Official Gazette. Certificates of correction published in the above-described manner will provide the public with prompt notice and access, and this is consistent with the legislative intent behind the American Inventors Protection Act of 1999. See 35 U.S.C. 10(a) (authorizing the USPTO to publish in electronic form). The listing of certificates of correction can be electronically accessed on the day of issuance at www.uspto.gov/patents/process/search/authority/certof correct.jsp. 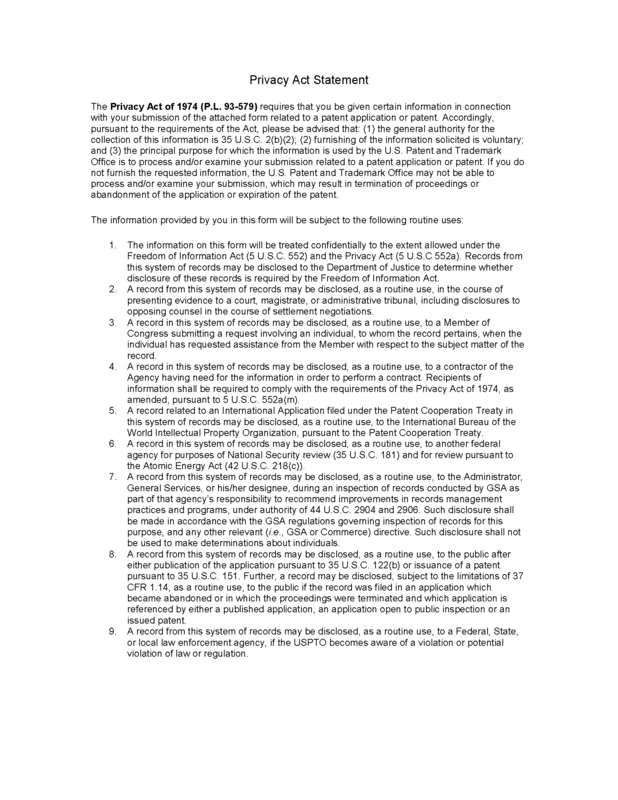 The electronic image of the printed certificate of correction can be accessed on the patent database at patft.uspto.gov/ and the listing of the certificates of correction, as published in the Official Gazette three weeks later, will be electronically accessible at www.uspto.gov/patents/process/ search/authority/certofcorrect.jsp.